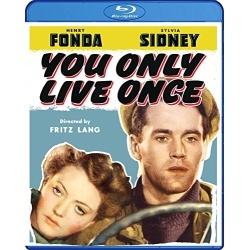 Three-time loser Eddie Taylor (Henry Fonda) has had enough of life behind bars. Determined to make good after an early parole from prison, Eddie finds devoted sweetheart Joan (Sylvia Sidney) waiting for him as he is released back into society. They soon marry and hope for a bright future together, but Eddie’s past confronts him at every turn making it difficult for them to survive. Fate then deals the young couple a cruel blow when Eddie’s convicted of bank robbery and murder all the while proclaiming his innocence. Desperate to escape from prison before he’s executed, Eddie gets hold of a gun and makes it past the prison gates, but not without tragic consequences. A haunting masterpiece, You Only Live Once was director Fritz Lang’s second American effort (after Fury) and a forerunner to numerous "criminal lovers on the run" films like Gun Crazy and Bonnie and Clyde. Made in the midst of the Great Depression, this unforgettable tale illuminates the cynical underbelly of American life that was otherwise lacking in late 30s cinema and delivers just as potent a narrative today as it did eighty years ago.